"Challenges associated with finding food have long been recognized as important in shaping evolution of the brain and cognition in primates, including humans," said Amanda D. Melin, PhD, assistant professor of anthropology in Arts & Sciences and lead author of the study. "Our work suggests that digging for insects when food was scarce may have contributed to hominid cognitive evolution and set the stage for advanced tool use." 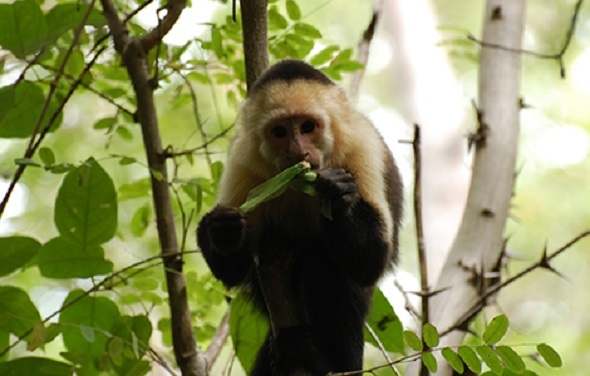 "We find that capuchin monkeys eat embedded insects year-round but intensify their feeding seasonally, during the time that their preferred food -- ripe fruit -- is less abundant," Melin said. "These results suggest embedded insects are an important fallback food." "Capuchin monkeys are excellent models for examining evolution of brain size and intelligence for their small body size, they have impressively large brains," Melin said. "Accessing hidden and well-protected insects living in tree branches and under bark is a cognitively demanding task, but provides a high-quality reward: fat and protein, which is needed to fuel big brains." But when it comes to using tools, not all capuchin monkey strains and lineages are created equal, and Melin's theories may explain why. Perhaps the most notable difference between the robust (tufted, genus Sapajus) and gracile (untufted, genus Cebus) capuchin lineages is their variation in tool use. While Cebus monkeys are known for clever food-foraging tricks, such as banging snails or fruits against branches, they can't hold a stick to their Sapajus cousins when it comes to theinnovative use and modification of sophisticated tools. "Primates who extract foods in the most seasonal environments are expected to experience the strongest selection in the 'sensorimotor intelligence' domain, which includes cognition related to object handling," Melin said. "This may explain the occurrence of tool use in some capuchin lineages, but not in others." "We predict that the last common ancestor of Cebus and Sapajus had a level of SMI more closely resembling extant Cebus monkeys, and that further expansion of SMI evolved in the robust lineage to facilitate increased access to varied embedded fallback foods,necessitated by more intense periods of fruit shortage," she said. While it's hard to decipher the extent of seasonal dietary variations from the fossil record, stable isotope analyses indicate seasonal variation in diet for at least one South African hominin, Paranthropus robustus. Other isotopic research suggests that early human diets may have included a range of extractable foods, such as termites, plant roots and tubers.